MADISON, WI--(Marketwire - January 22, 2008) - On Tuesday, January 22, 2008, St. Mary's Hospital and two members of the Dean Orthopedic physician team will offer viewers the opportunity to see a total knee replacement surgery up close. The procedure will be broadcast live over the internet on www.OR-Live.com from 4:00-5:00 p.m. Central Standard Time from one of St. Mary's 18 brand-new, high-tech operating rooms which opened the first of the year. 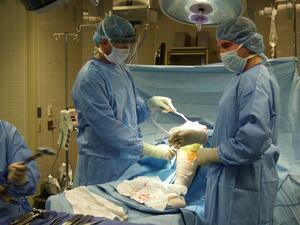 This total knee replacement procedure will be performed by Dr. David Wolff. Dr. Wolff is one of the area's leading orthopedic surgeons having completed over 450 hip and knee replacement surgeries in 2007. Commentary will be provided during the surgery by Dr. Richard Glad, Chairman of the Dean Department of Orthopedics. Also a very busy and successful orthopedic surgeon, Dr. Glad's patient list includes athletes such as John Powless, one of the top-ranked players in the International Tennis Federation's men's 75+ age category. Dr. Glad's patient list includes athletes such as John Powless, one of the top-ranked players in the International Tennis Federation's men's 75 age category.